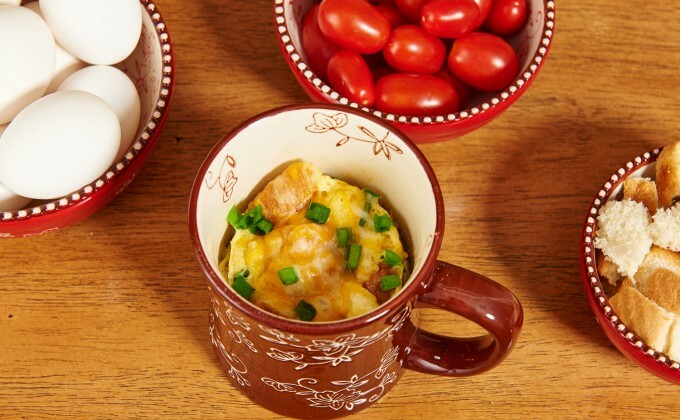 Place eggs, milk, butter, salt and pepper in a temp-tations® 16 ounce mug. Whisk with a fork until all egg whites are broken up. Top with diced grape tomatoes, torn bread, cheese and herbs. Mix ingredients together with a fork, making sure that all ingredients are covered with egg mixture. Microwave for 4 minutes or until egg is fully cooked and garnish with green onion if desired.